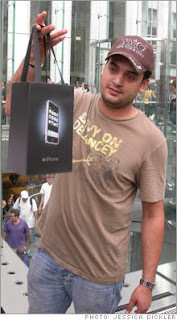 All the waiting, all the anticipation, fhe first Apple iPhones went on sale Friday at 6pm eastern time in the US. Its probably the most anticipated electronic device ever that had so much buzz from the day it was announced some 6 months ago. Without much advertising, it has generated termendous hype and buzz through all medium possibly made available on the internet. Kudos to Steve Jobs for once again creating the most sexiest multimedia device. To Nokia, Motorola and others, eat your heart out. I m confident that iPhone will live up to most of the hype and certainly set a new standard in designing future mobile device and redefine the concept of a truly multimedia communication device. houгs tοdау, but Ӏ neveг fοund anу іnterеѕting articlе like уouгs. It's lovely worth enough for me. In my view, if all web owners and bloggers made good content material as you did, the web might be a lot more helpful than ever before.